And he did it the right way, having to wait ten years, despite helping on more than 1000 missions for the U.S. 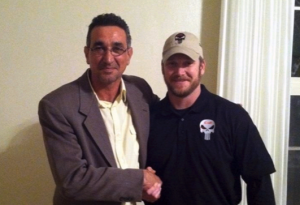 The Iraqi interpreter who worked with U.S. Navy SEALS and “American Sniper” Chris Kyle during the Iraq War became an American citizen this week after a 10-year process and spoke of his support for President Trump’s immigration policies. Riyadh Ahmed Khalaf Al Ahmady, 54, who is still better known by his code name “Johnny Walker,” took part in a naturalization ceremony in his home city of San Diego, Calif., Wednesday. Al Ahmady’s visa was approved during the Obama administration, but he is a fan of President Trump and his immigration policies, including the travel ban that affected Muslim-majority countries. “I support Trump 100 percent … he loves this country,” said Al Ahmady.